This title comes from a song called Closing Time by Semisonic and a quote attributed to Seneca, but this post is really about keeping it open. 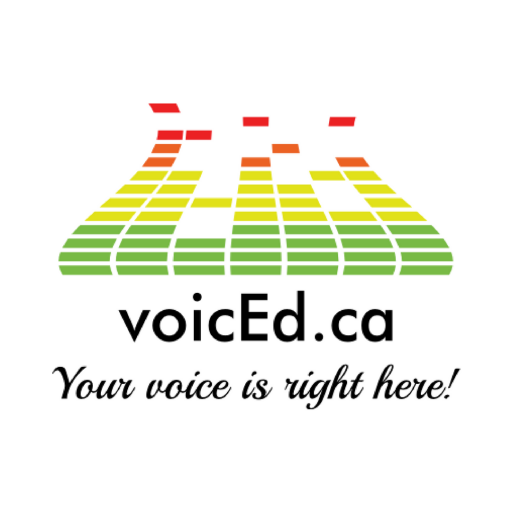 Last January, the OnEdMentors team of Stephen Hurley, founder and chief catalyst at voicEd Radio, Derek Rhodenizer, school administrator and podcast host, and I met to consider what more we could be doing with our weekly show. 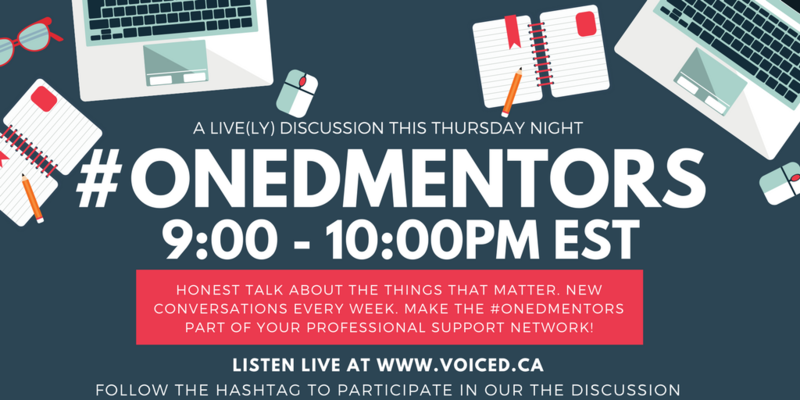 OnEdMentors, which to date is the longest running show on voicEd, is a live broadcast that began as tool to support preservice and new teachers. It evolved to become a panel of educators who support each other, and it’s something we all looked forward to each week. For a long time, I had been thinking about mentorship. When I was invited by Derek to join the OnEdMentors team in January of 2016, I was elated to engage in the kinds of conversations that could guide new educators and was even more excited to be part of the burgeoning voicEd community. I was also amazed by how much I was learning from everybody. I have had a few mentors in my life that were transformational, and the idea that brewed from the catalyst of wanting to grow OnEdMentors was in many ways fed by the nurturing I received from my two most impactful mentors. I knew that mentorship could be the key to improved professional development experiences. I wondered how we could grow OnEdMentors beyond voicEd and also filter it back to voicEd. I first met Leigh Cassell when she was a guest on my show, The Personal Playlist Podcast. My friend Rola had mentioned her often and Leigh’s digital Human Library was an innovation I wanted to learn more about. We really had a great time together, so when we spoke about growing OnEdMentors, her name immediately came to mind. I reached out to her, and Leigh saw the possibilities from the start. We went back to to Stephen and Derek with the notion of a community and then began the plan for OnEdMentors Connect. Leigh and I met to evolved a phased approach which was going to be a gradual release in our efforts to build a mentorship community through a collaborative inquiry. At that point, Leigh and I were meeting weekly, and we began to invite some incredible educators into the process. We wanted a phase to pilot this idea with a small group, a phase to extend the offering and embedded time to ask questions, reflect and gain perspectives before rolling this out into the open education community. We had to begin by framing the problem. I kept seeing the problem framed and reframed, but I never read a solution. I wondered if a solution could be a more personalized approach. After planning and assembling the team, Leigh and I crafted the statement of our exploration: a collaborative inquiry into the impact of a 1:1 self-directed mentorship experience on professional development and improved student achievement. We wanted to work through this challenge live on the radio and use each phase as a learning cycle. 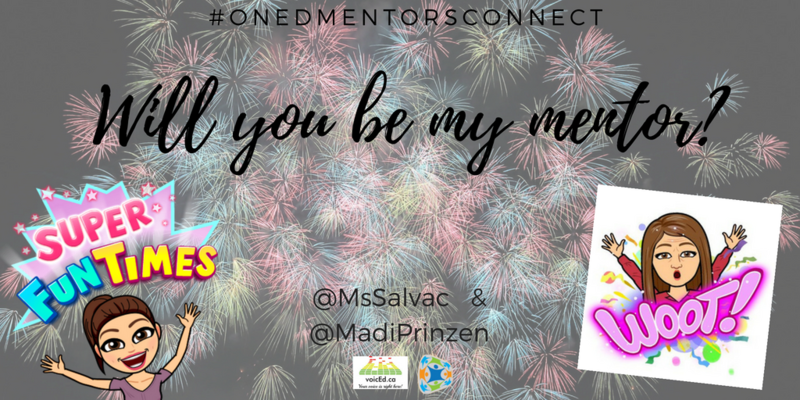 Episode One was the launch of OnEdMentors Connect which quickly became called #OEMConnect (Thank you, Rolland). I wrote about it on my blog and embedded the audio from first the show there. In that episode, we introduced some of the mentors who had registered for the pilot and added their profiles to the OnEdMentors section of digital Human Library (dHL). We introduced our critical friends, Mark Carbone, Helen Dewaard and Peter Cameron, who would watch and listen in order to help us evolve this offering, and we met our 5 mentees, new teachers working in various capacities and willing to take this leap with us. After that night, the mentees were tasked with choosing a mentor from the OnEdMentors Connect profile pages on dHL. 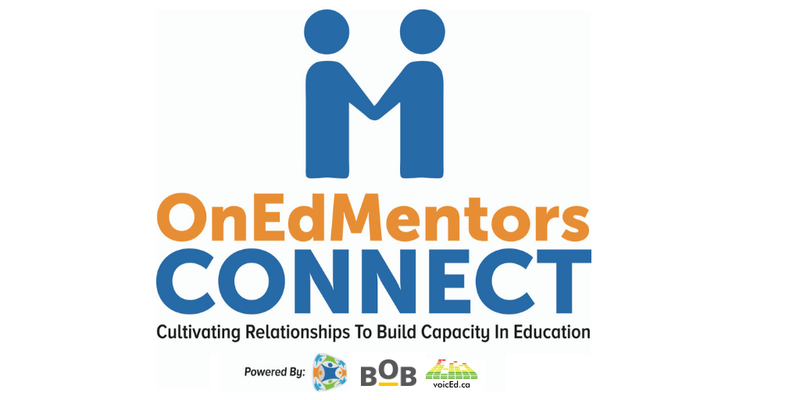 We caught up with our mentees the following week on Episode Two of OEMConnect on the OnEdMentors show. We heard how mentees chose their mentors and how even asking for those individuals to become their mentors was personalized. There was the mentor-posal (think prom-posal) created by Sarah Lalonde, and there were various others ways that included images and videos that people asked someone to become their mentor for the next few months. The second episode was about sharing that first foray into the OEMConnect experience, and then the pairs were off with three months to connect and see where it took them. Over those months, we continued collaborating, Not only did Leigh and I meet regularly, but we developed a logo with the help of her brother-in-law to reflect our work. We invited everyone in the pilot to share their opinions on everything from the image to the colours, and we settled on something that we all really love and speaks to all we think this can become. We even started a Twitter handle. There were a few requirements throughout the process. Each mentor, as previously noted, had to have a profile up on the dHL. Additionally, everyone had an entry and exit survey to complete. Finally, both mentors and mentees were asked to track their experiences. Suggestions were given and tracking sheets were provided, but everyone brought something unique to that experience, too. Jen Giffen sketchnoted her first meeting with Jonathan Cowper. Eryka Desrosiers and Sarah Lalonde used their podcasts to reflect and share what they were learned from each other. Rolland made this video. Everyone that was on Thursday night’s final Phase 1 OEMConnect episode of OnEdMentors shared a lot of important insights that will help us iterate this opportunity for the next phase of the inquiry. 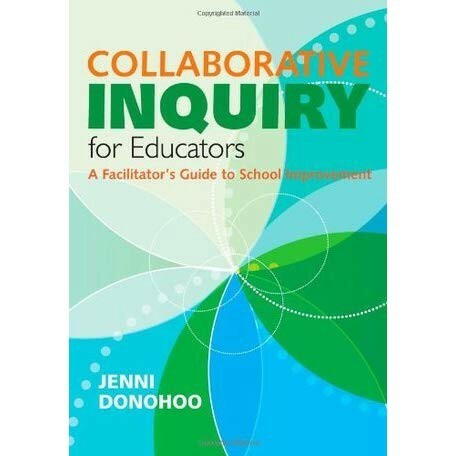 the four stages of collaborative inquiry are: framing the problem, collecting evidence, analysing evidence and documenting, sharing and celebrating. We have collected evidence through Phase 1, and the final episode of Phase 1 on the #OnEdMentors Show was an essential place to gather data, hear many points of reflection and raise a lot of important questions. We will be sitting down with Stephen and Derek and joined by our critical friends to talk through and analyse the evidence before going through another cycle beginning in January. The last stage of a collaborative inquiry is documenting, sharing and celebrating, which is why I wanted to write this post. Before we began Phase 2, I needed to take a moment to reflect back to when this was just an idea. Whatever happens from here, I am deeply grateful to everyone who is working on this with us, the many others who think this is a wonderful and timely idea, and my partner, Leigh Cassell, who has put more time into this than I could have ever asked. When you are driven by something that you know can make a difference for so many, it’s hard to stop. Phase 2 successfully launched on January 10th, 2019. Curious? Learn more about Phase 2 here! This post was contributed to Digital Human Library by Noa Daniel at Building Outside the Blocks.